The Student Government Association met this past Monday, with its largest order of business being to hold elections for the new assistant vice president of university advancement as well as a new director of public relations and special events. Both positions had been vacated earlier by their officeholders the prior semester. In the election for the position of AVP of University Advancement, the candidates were Jason Brooks, Kevin Daus, Junior Eliscar, Robert Emmanuel, Christine Martin and Sarah Niles. The first ballot ended in a tie between two candidates, forcing a second election. 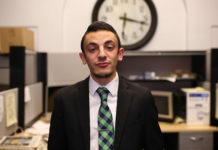 In the second election, Emmanuel, a sophomore finance major, won on the second count. Discussing his goals for the rest of the semester, Emmanuel said that planning a successful senior celebration was key. “I have to make sure that everything is set for that. I have to call up Landmark, call up Chickie’s, call up Kegglers, and make sure that that goes off well,” he said. 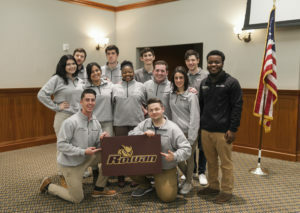 Emmanuel also mentioned one of his long-term goals in the position revolved around connecting with Rowan alumni. The election for the director of PR and special events was also a crowded field. Running for the position was Zanib Ahmad, Brooke Eisenberg, Morgan Hurley, Nayamah Kolliegbo and Kevin McCarthy. Kolliegbo, a junior biological science major was declared the winner of that contest. “So [in] my term here with SGA, I really just want to bring forth more engagement, as a diverse crowd, and bringing everyone together, just planning events catered to the university that will benefit everyone as a student body” Kolliegbo said. Another important part of this position is putting together the “Bring Back the Boro” clean up. 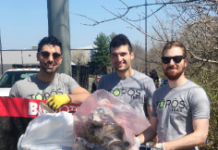 Student and faculty volunteers [could] band together to clean up our city of Glassboro. 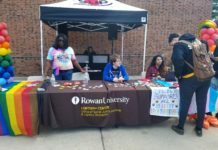 “Everything is still under wraps, but I’m ready to, you know, dig into it because that’s one of Rowan’s biggest events, and it’s catered to the community, so I’m really excited for that and I look forward to what’s to come,” Kolliegbo said. In the open session portion of the meeting, one of the speakers was Adelyn Simeone, a senior psychology major. She was there on behalf of the Admissions Office where she works as an Office Ambassador. Simeone spoke to students about applications for ambassador positions that are opening. The application is found on ProfLink and is open until March 2 at 11:45 p.m.
Additional reporting by Matt Kass.